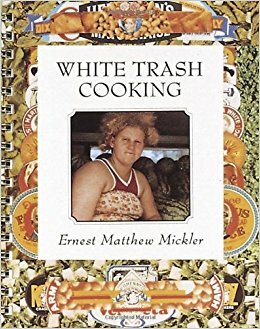 In the 1980s, some folks wrote off Ernie Mick­ler, author of “White Trash Cook­ing,” as a yay­hoo curios­i­ty. Oth­ers thought him one of the most bril­liant South­ern folk­lorists and pho­tog­ra­phers of the 20th cen­tu­ry. But per­haps most impor­tant­ly, Mick­ler left behind a tes­ta­ment to the fact that all South­ern­ers — even those at the mar­gins — have a right to claim their roots. In spring of 1986, Ernest “Ernie” Matthew Mickler’s “White Trash Cook­ing” land­ed on book­shelves across Amer­i­ca — a 160-page, spi­ral-bound anthol­o­gy of South­ern recipes, sto­ries, and pho­tographs. Odd­ly enough, damned near every­one loved it. It was imme­di­ate­ly revered by lit­er­ary snobs, South­ern aris­to­crats, Yan­kees, folk­lorists, down-home folk, and peo­ple on either side of the Mason-Dixon. This entry was posted in Uncategorized and tagged ernest matthew mickler, white trash, white trash cooking. Bookmark the permalink. I’m a col­lec­tor & lover of cook­books. Every cook­book I buy is read cov­er to cov­er. When I bought “white Trash Cook­ing” I imme­di­ate­ly read it. This is the best cook­book I have ever read. I enjoyed it so much I had to share it with my friend who is a Flori­da native.